UBERMORGEN, Do You Think That's Funny?, 2013, mixed media, dimensions variable. Roland Barthes once famously proclaimed that as individuals we must become active within a system in order to demonstrate our agency and, as circumstances require, offer resistance, which means (in terms of semiotics) to distort the codes rather than to destroy them. UBERMORGEN’s current exhibition, “userunfriendly,” unpacks this idea through the lens of media activism and institutional critique. Hans Bernhard and Lizvlx (Maria Haas) achieved prominence as an artistic duo with [V]ote-Auction, 2000, a work that is featured prominently here. During the 2000 US presidential election, voters could auction off their votes via a website UBERMORGEN created. The aim of this work was to flood the dark cavities in the electoral system with the light of pertinent marketing strategies. In the exhibition space, alongside video documentation, visual and spatial materials are presented: for instance, the work’s logo as well as approximately nearly 1,500 pounds of printed e-mails. The oscillation between fact and fiction that forms one part of the essence of UBERMORGEN’s practice is brought up to date with the extensive installation Do You Think That’s Funny?, 2013, which was developed specifically for the exhibition. 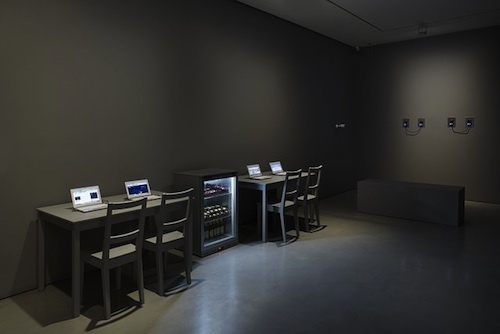 In a room painted completely gray are four computers that offer visitors the chance—by following UBERMORGEN’s instructions—to surf the Web with complete anonymity and dare to venture into unknown terrain. The high point of this installation is formed by four computer circuit boards mounted to the wall and connected to each other in pairs on which, supposedly, encrypted data of the so-called whistle-blower Edward Snowden circulates in an endless loop. If one disconnects the circuit boards, the data will be irretrievably lost. The concept of subversion has its origin in the realm of agriculture, in which it designates the turning of the soil to cover newly planted seeds—a productive activity. To be sure, the methods of UBERMORGEN could be characterized as productive subversion or (respectively) subversive production. Not only does the duo always succeed in inscribing itself into the everyday world of mass media with its works, but UBERMORGEN is also able to reformulate even traditional art media such as painting, photography, installation, and performance in the digital age and transform them into an autonomous aesthetic practice.